I address you for the first time as author of this quarterly missive. I certainly consider it a challenge and I hope that I can satisfactorily follow in Alvaro’s footsteps! As ever, we would prefer to write to you every five years; such is our minimum investment horizon. But, we also believe that it may be helpful for our co-investors to understand the constant evolution of our investment strategies, particularly during volatile periods. We hope this letter provides a record of transparency and accountability to better inform you about our investment views. As these figures illustrate, during the reference period, our funds have performed in line with the indices. We readily volunteer that we will not always outperform our benchmarks, and we may occasionally perform worse. During the month of October, we witnessed a widespread decline of the world’s stock markets which has caused this year’s cumulative return to move into negative territory. In this context, our International portfolio has performed better, with a cumulative decline of -3.1% vs. -4,5%. for its benchmark index. The Iberian portfolio has returned -12.3%, in line with its benchmark (-7,7%). From a longer-term perspective, the table below shows the total return from inception until 31st October 2018. As indicated, during these almost 3 years, both the Iberian and the International portfolio have outperformed their benchmarks, by 17.7% and 8.8%, respectively. If we annualize these returns, the Iberian portfolio has generated 6% annually and the International portfolio 5% annually. Amidst these recent declines, I believe it is appropriate to reflect upon principles that many of you will surely be familiar with but which I think bear repeating. Azvalor has always strongly advocated that equity is the best asset class to compound savings in the long term. This will be easily understood by any observer of its track record. As documented and argued by Jeremy Siegel in his book “Stocks for the Long Run”, the stock market has historically generated a cumulative return exceeding other assets by a large margin. This is true for almost any long-term period in the last 200 years and is clearly reflected in the following graph (total real return of the different asset classes in the US). Yet, equity is “conspicuous in its absence” in most people’s assets. In Spain, for instance, it represents only 2.8% of total net household savings. Even if we only refer to financial assets (many people have a limited savings capacity beyond what is needed for basic sustenance: real estate, housing) its weight is a mere 8%, i.e. a fraction of what is usually allotted to current account balances or fixed-income securities – assets which have proven to be clearly inferior for long term wealth generation. In other countries, these proportions change but the principle is essentially the same. One may well wonder why this is so – why is the average saver reluctant to invest in equity? We believe the key lies in the “difficulty” of investing in equity. This difficulty is not just that it requires knowledge and great commitment, for you can always delegate the task to an investment professional (which I would recommend) or invest in a passively-managed vehicle. In our opinion, the nature of this difficulty is more emotional. In fact, to reap the attractive rewards that equity offers, savers must sacrifice something in return. Given the nature of the market, these sacrifices can be very tiring by constantly testing the nerves and character of the investor. Although long-term returns are undeniably positive and superior to other alternatives, everyday experience feels very much the opposite. As shown by the study of a renowned mathematician and hedge fund manager, Robert Frey, in the past 180 years, the world’s most important market, the US stock exchange, has been in loss 75% of the time as measured from its previous highwater mark. Even if we only examine the post-world war period, the result is not much better. Since 1950, it has experienced such losses 66% of the time. And 50% of the time, these drawdowns have reached 5% from a previous highwater mark. Even more distressing, 40% of the time the market has suffered 20% drawdowns (these figures are reflected in the graph below, where the red areas represent falls from previous highs). 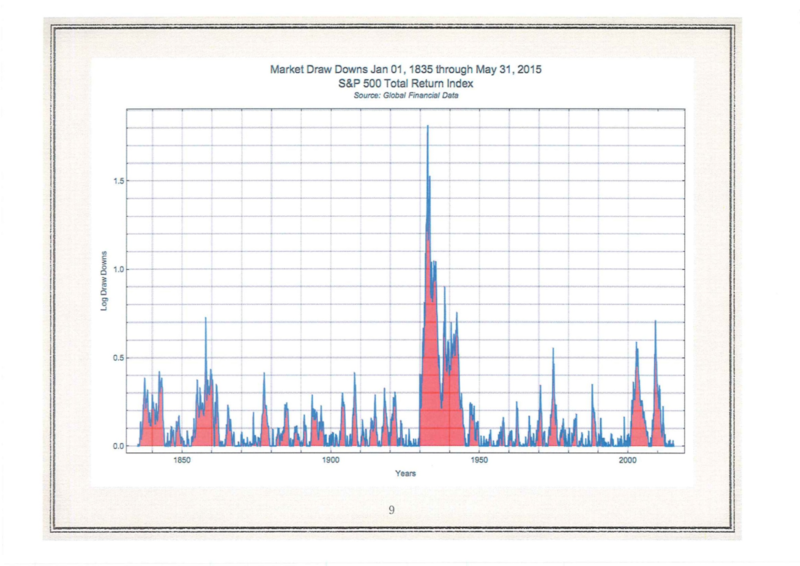 In the light of this evidence, I agree with Frey when he says that equity investors are most of the time “repentant”. I insist, however, that this does not contradict the idea that long-term returns are clearly positive. After all, the data below is the very same that populates the above long-term chart. It is probably for this reason (and this, again, is a fact) that the average investor obtains a long-term return which is significantly lower than that the equivalent index return. This means that investors don’t usually make good purchasing or selling decisions, and often decide to buy only after substantial increases and to sell when the market falls. As evidenced by numerous studies, this occurs often enough that it reflects a behavioural pattern which is statistically significant. Consequently, the experience of equity investors often leaves a rather bitter taste. It is a source of satisfaction and a competitive advantage for Azvalor to have co-investors that have proven to be enlightened value investors who are not daunted by market downturns. To a large extent, I think that we should also congratulate our Investor Relations team and our Call Centre for their work in this regard. If you aspire to beat the market, I recommend that you invest in a value manager who has demonstrated long-term results (choosing the right value manager is no easy task nor is it free of errors, but we will expound upon this issue in subsequent letters). If investing in equity is, in general, quite challenging, it may be said that following a value investing strategy is the very opposite of a “triumphant march”. The path to achieving extraordinary returns resembles a gruelling obstacle race. Value investing is to buy an asset for less than it is worth – it is as simple as that. But this straightforward concept is not quite so simple in practice. To buy at a good price it is often necessary to purchase assets that have dropped. And these are no fickle falls. Investors flee in large numbers when assets face serious adversity. Historically, the most spectacular opportunities offered by the stock market have often occurred about assets that were reviled, despised and perceived as risky. But it is precisely at times like these, when the situation is most distressed, that it is the right time to invest. As the legendary investor Howard Marks said: “when everyone believes something is risky, their unwillingness to buy usually reduces its price to the point where it is not risky at all. Broadly negative opinion can make it the least risky thing since all optimism has been driven out of its price”. In saying this, we don’t mean to imply that investors should “embrace” any assets facing financial hardship, for it also requires separating the wheat from the chaff, the opportunity from the value trap. Investment mistakes will be unavoidable. But remember that value investing often requires swimming against the tide, feeling lonely and, above all, being all alone facing the risk of making a mistake (which is doubly frightening). Believe me when I say that it is much easier for a professional manager to explain why he has made a mistake buying Nestlé or Amazon than when he has done it buying New Gold. In short, it is an “uncomfortable” investment, often in assets that are truly unpopular and, even when you get it right, there is a risk that they will continue to fall further in the short term. The renowned investor Michael Steinhardt summed it up well when he said: “the hardest thing over the years has been having the courage to go against a dominant wisdom of the time, to have a view that is at variance with the present consensus and bet that view. The hard part is that the investor must measure himself not by his own perceptions of his performance, but by the objective measure of the market. The market has its own reality. In an immediate emotional sense, the market is always right, so if you take a variant point of view you will always be bombarded for some time by conventional wisdom as expressed by the market”. Experience shows that few are capable of and/or are backed up by their co-investors and/or supervisors to venture into such a “politically incorrect” strategy. The investor, and especially the value investor who can beat the market, must constantly overcome behavioural traps that human beings fall into simply because they are human. We will expound on them in future communications. For the time being, suffice to say that our work requires us to weather the storm of false narratives, to resist the strong temptation of conformity with the crowd or the tendency to extrapolate the recent past linearly. Only thorough analytical work undertaken by a devoted investment team does one generate the conviction to seize market opportunities instead of becoming their “victim”. In our recent history, for instance, the +20% returns obtained in 2016 by the International portfolio required withstanding the test of losing almost 20% during the first months of the year. We were told to “Have courage”! (“Ten valor” in Spanish) I take this opportunity to congratulate our co-investors once again, the majority of whom passed the market’s “exam”. Álvaro and I were firmly convinced that our portfolio offered an extraordinary opportunity back then, but as we insist, time and again, if you don’t behave like value investors in times of stress, then you will not maximize returns. The International portfolio is a good example of investing in “uncomfortable” assets. The companies that make up this portfolio have fallen by 60% on average from their previous highs, which were mostly reached between 2011 and 2014. These declines did not occur at random, for no apparent reason, but were “in tandem” with their plummeting results. However, our analysis indicates that the future of these companies is much more promising than what is reflected by their share prices. If we get it right, our returns will clearly exceed those obtained by the market (for instance, if every company reached its previous peak levels again, the portfolio would increase by 150%). To “keep our cards close to our chest”, and keying on the idea of uncomfortable investments, I will refer to an example that has already borne fruit which we sold entirely in 2016. The analysis I will now attempt to explain, in a highly simplified form could apply, in broad strokes, to many of our major investments today. We bought shares of the copper mining company Antofagasta from late 2015 to early 2016, when it reached a trough of 3.5 pounds per share, after plummeting by 75% from its peak levels in 2011. At that time, the price of copper was at $4.200/t, implying a 60% decline from its previous highs. At 3.5 pounds, Antofagasta traded at 15x the profits the company would generate in a full year with copper trading at these low levels. Considering the 20-year mine reserve life, Antofagasta’s share price was reflecting that the price of copper would remain at these levels or worse in the very long run, i.e. basically until the end of its aggregate mine life. At these copper prices, almost 25% of world production was generating negative cash flow for each tonne mined, and an even greater percentage generated accounting loss after depreciation expense. Unsurprisingly, several mines announced a freeze on production, definitive closure or even bankruptcy. In other words, the market was inferring that there was a surplus of copper and that demand would decrease significantly in the long term. This demand scenario not only ran contrary to the historical growth of copper consumption of 3% annually for the past 150 years, but also implied the urbanization process and economic growth in most of the world would grind to an almost complete halt. Further, our analysis required dismantling the false narrative of a super-cycle in China as well as other considerations regarding the future production of copper. In brief, the global supply/demand scenario reflected in Antofagasta’s share price beggared belief. In Antofagasta, we were investing in an efficient copper producer, with a strong balance sheet and a long history of making the right capital allocation decisions. In fact, the price of copper recovered much faster than we expected and before the end of the year it had already reached $6.000 per tonne. Antofagasta’s shares did the same, and we sold our investment gradually and entirely at a level of 8 pounds per share, which continued to rise to over 10 pounds. Nevertheless, both copper and Antofagasta’s shares are still a long way from recovering the previous peak levels of 2011 when they reached $10.000 per tonne and 16 pounds per share, respectively. Our investment in Antofagasta was uncomfortable owing to the sustained and ongoing decline since 2011 and the possibility that it would continue falling in the short term, as well as the large number of analysts who, in explaining the causes of the poor share price performance, manufactured a whole arsenal of reasons for concern. The bombardment of questions and sceptical opinions that were barraged at us at the time were a clear indication of this discomfort. The outperformance achieved in 2016 in the International portfolio accounts for most of the best returns obtained since its launch. During 2017 and the first 9 months of 2018, it didn’t seem to do “much” different from the indices, and even showed a slightly poorer performance which, I admit, triggered questions and doubts, in some cases. Again, it has been a period of almost 2 years during which our investors have had to behave like true value investors by showing a great deal of patience with results that “play hard to get”. During the month of October, it has performed better, this time falling less than the market in general. We don’t know if this better relative performance will be “the good one” that will make us inflect upwards or if, on the contrary, we will still have to pass new exams. But the truth is that we have been observing “green shoots” for some time in the businesses of many of our major investments (companies such as Cameco, Tullow, Buenaventura, Serco, Ensco, Transocean, Consol or Petrofac). In many cases, we do NOT need results to improve, but simply need the market to stop been sceptical about the sustainability of the improvement that has already taken place. In any event, the quality of our companies’ assets, their robust balance sheets, the commitment of their managers and, above all, the prices at which we have bought them, gives us the utmost confidence in our portfolio and we are convinced that it will deliver strong returns. After the recent falls, our International portfolio offers a 125% upside potential to our estimated intrinsic value. One of the most common questions we are asked is how we bridge the “gulfs” (not only in the geographical sense of the word) of our investments in the International portfolio. Firstly, we try to narrow down our circle of competence (we introduce a good number of filters to discard many names). Moreover, as we have explained on other occasions, we follow an intense due diligence process which includes meeting with a large proportion of the ecosystem of these companies, as well as third-party experts, and participating in industry conferences. Another way we mitigate this difficulty is to “pack our bags”. Over the past few months, we have travelled to Pennsylvania, Texas, New Mexico, Oklahoma, Peru, Senegal, Canada, Sweden, Kuwait, Greece, Norway, New York, Poland, Miami and London, among other places. We not only meet with the managers of the companies in which we invest at their headquarters, but also visit their assets, whether they be mines, offshore platforms, production plants, supermarkets or oil wells. We expect that this in-depth research coupled with the wide total addressable universe renders the International portfolio capable of achieving returns that are equal to or better than those obtained “at home”, as we have done in the past. In addition, it should be clarified that distance is less important when we invest in cyclical global businesses, as is often the case. Here, the important thing is the analysis of the industry cycle in question, and of the assets of our companies. We have invested in cyclical businesses with good results many times before and we are convinced that it will be no different with the current portfolio. We observe with some concern the current political situation in Spain. The policies that generate the creation of prosperity and wealth are, from our perspective, crystal clear. And in general, diametrically opposed to those which the new government intends to adopt. We don’t know if these measures will be sustained, nor if they will have a short or a lasting impact on Spanish economy. This will hinge on how much the political gamesmanship stretches into subsequent years, something which is difficult to anticipate. However, you should bear in mind that the exposure of our Iberian portfolio to the Spanish economy is quite limited – only 20% – considerably lower than what you would probably expect. More importantly, the valuations at which we have invested offer a great margin of safety, which ensures that their expected return should not be too affected. Even though the more recent evolution of the Iberian portfolio has been volatile, the results of many of our companies are clearly improving and their perspectives are even better. Some of our investments are experiencing difficulties which we hope will be temporary and we also believe that they trade at a great discount over their intrinsic value. In general, our investments in the Iberian portfolio trade at modest multiples of results that are still depressed, and more attractive multiples of results that we expect will improve, too, in the medium term. As we always say, on occasions we may get it wrong. But if we do it in proportions that are like those registered in the past, the global result will not be affected. After the recent falls, our Iberian portfolio offers an 80% upside potential. As we approach our third anniversary, we have decided to renew the image of Azvalor. You will soon be able to see it in our website and communications. We would like to clarify that this is but a mere symbol of something far more significant. In the past few months, we have engaged in a thorough reflection and have been hard at work to reinforce our company culture and values. This exercise has logically involved the entire organization. In Azvalor we hope that the values of all our employees include excellence, humility and “skin in the game”. The challenge is that all this does not simply remain a vain hope or is full of “hot air”. To this end, we are adopting a plethora of processes, actions and incentive systems that encourage it. To give you an example, to reinforce the “skin in the game”, among the incentive system we have established the obligation for all company employees to invest long term a part of their bonus in our funds. Only our Compliance and Risk Control staff is exempt from this obligation, as we want to leave their independence intact. The clear majority of Azvalor’s employees are already investors in our funds, and many of us have exceeded the limit established by this new obligation. As we have said on several occasions, Azvalor’s employees are, together, the first investors by size in our funds. I wish to thank all the people who make up Azvalor’s team for their great enthusiasm and warm endorsement of the above. And I shall say to you, wholeheartedly and humbly, that I believe these values are truly ingrained within our DNA. We hope you will be able to identify them when you have the chance to interact with us and that they will be reflected in our work. Finally, I would like to conclude this letter by thanking you again for your trust. We undertake the serious responsibility of taking care of your savings with enthusiasm and discipline. And we are convinced of, and even thrilled with, the great investment opportunity offered by the collection of companies we own as shareholders.